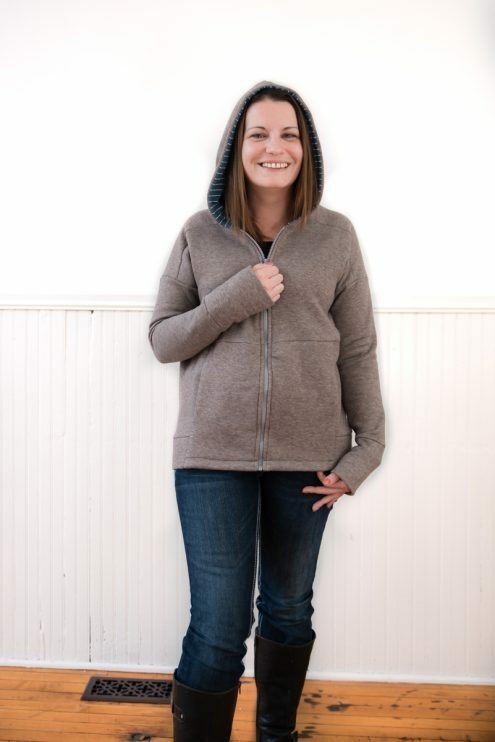 Keep yourself warm in the cozy Clio Zippered Hoodie. 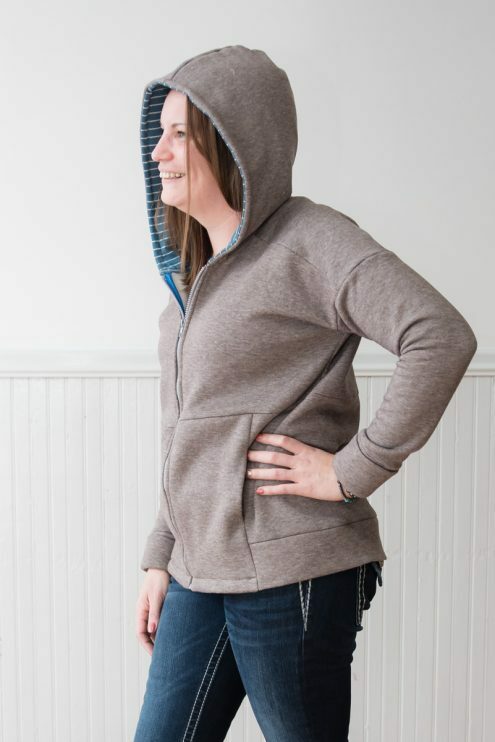 The roomy hood keeps you under cover even while wearing a bun, the sleeve cuffs can be worn short or long, and the seam pockets are the perfect size and super easy to add. 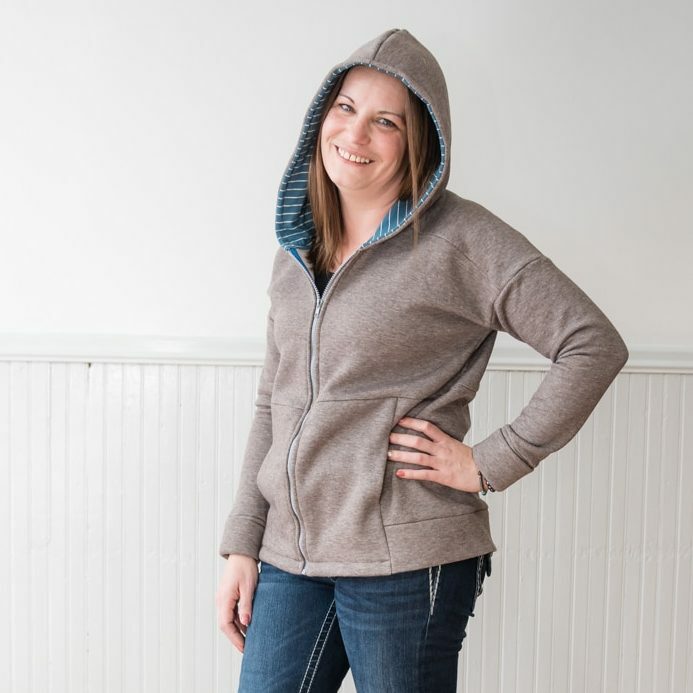 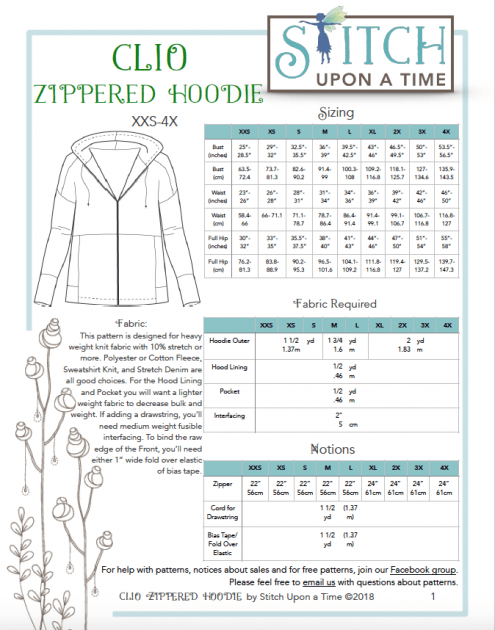 Whether you’re an advanced beginner or above, you will enjoy sewing this hoodie as there are simple and fine finishes to choose from. 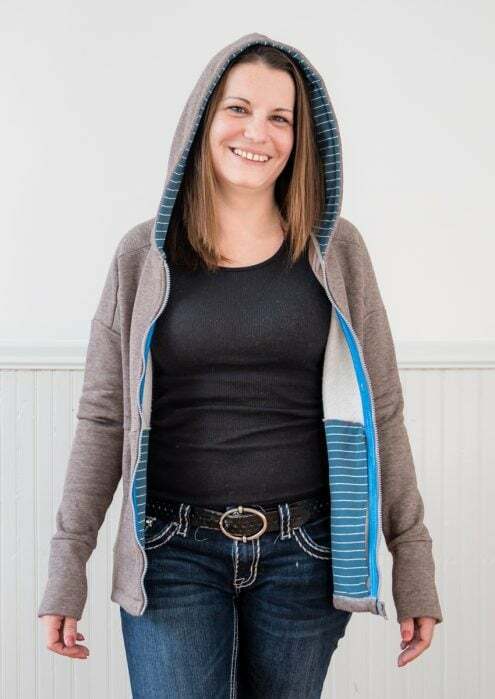 See what others have made in our Clio Zippered Hoodie Gallery. 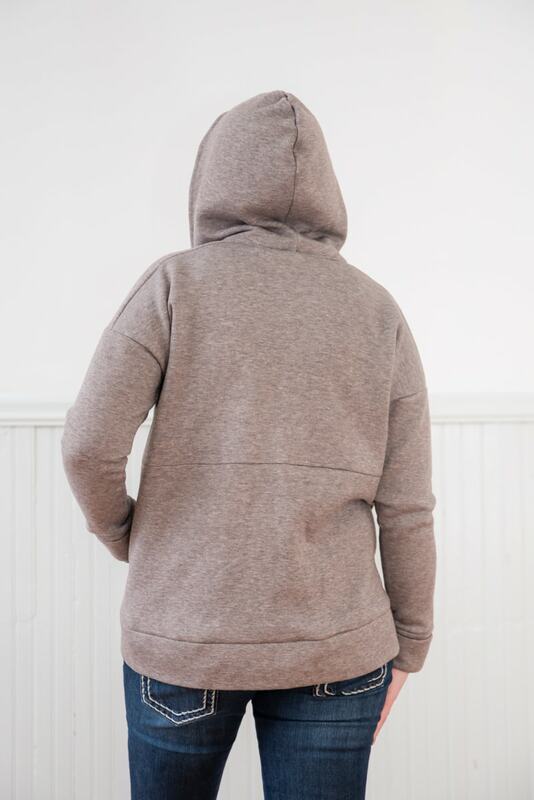 The Clio Hoodie is designed for a height of 5’6” (167.6cm). It has a length that falls to about the Full Hip in the front and it’s about 1” longer in the back. 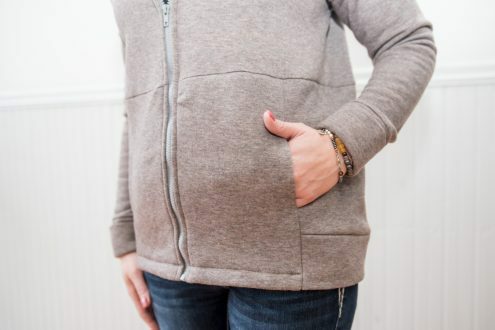 The sleeves have extra long cuffs which can be flipped up, so they are wrist length, or left long, giving you a 2 1/2” longer sleeve. 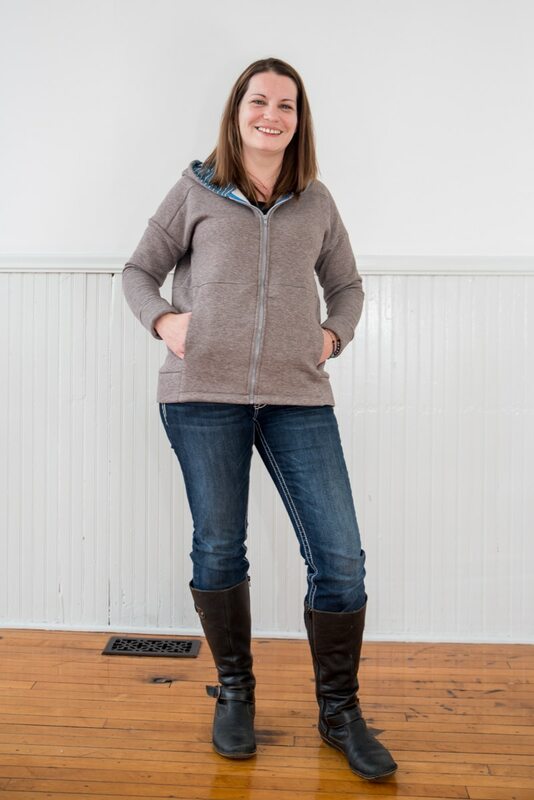 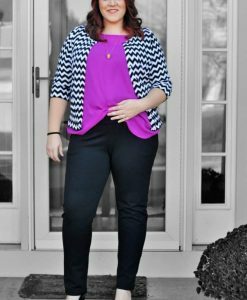 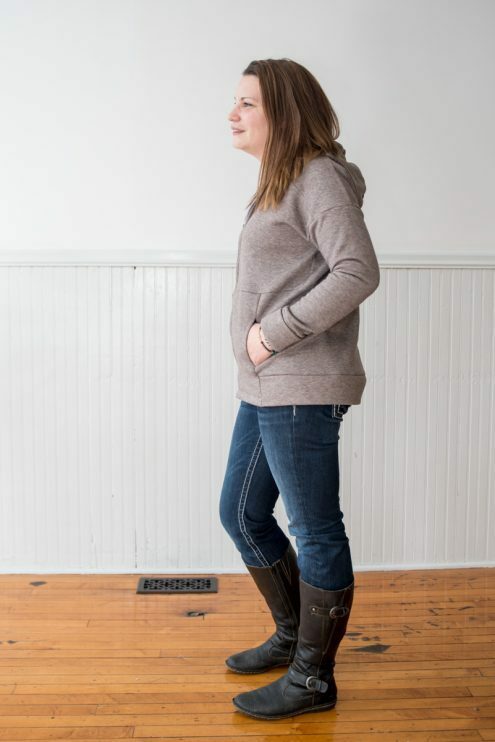 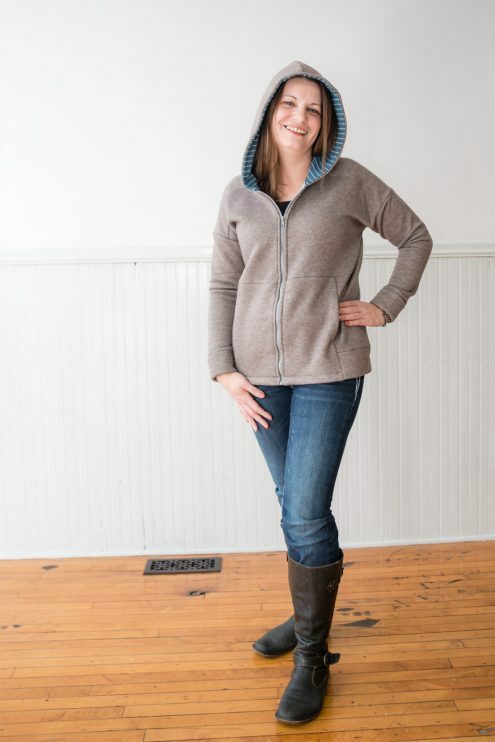 The dolman sleeves make the hoodie comfortable and an easy sew. You can choose to add a drawstring to the hood and pockets to the front seams. 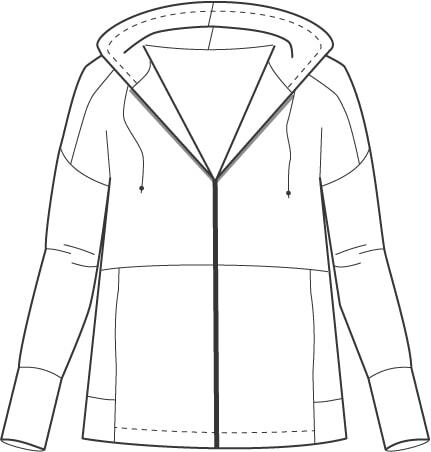 Techniques Involved: Sewing a knit band, topstitching, sewing in a zipper, finishing seams with bias tape(optional), sewing a lined hood, adding a drawstring(optional), sewing seam pockets(optional), and hemming. 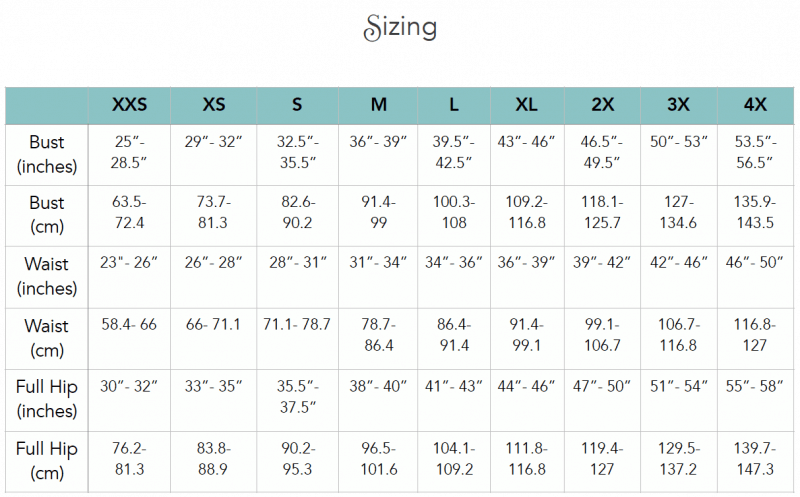 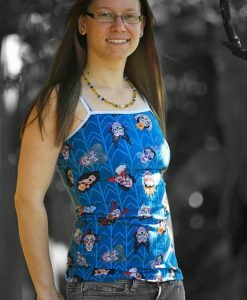 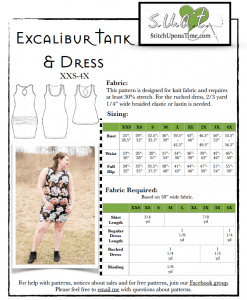 This pattern is designed for heavy weight knit fabric with 10% stretch or more. 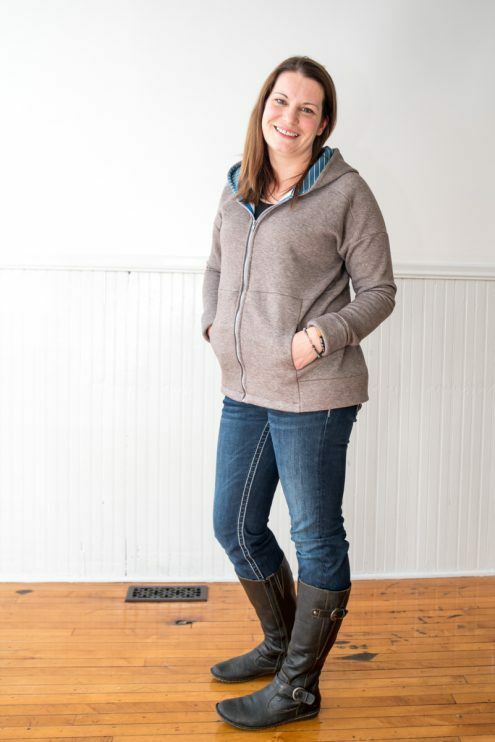 Polyester or Cotton Fleece, Sweatshirt Knit, and Stretch Denim are all good choices. 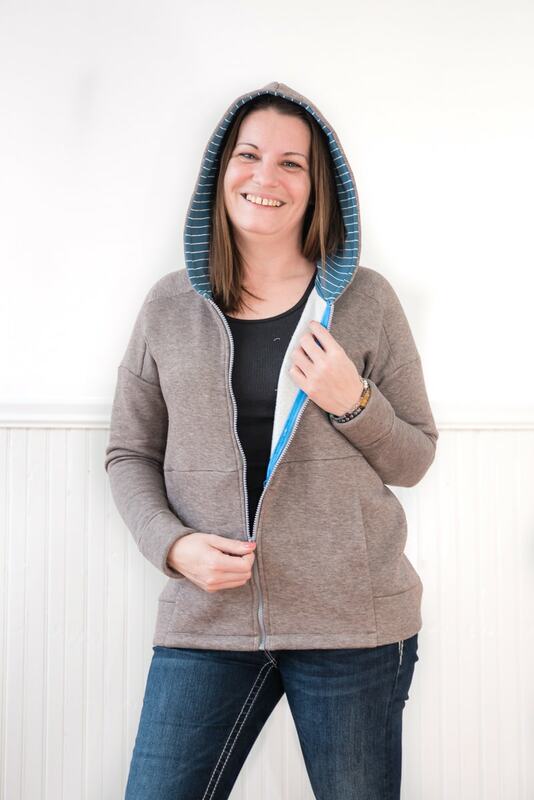 For the Hood Lining and Pocket you will want a lighter weight fabric to decrease bulk and weight. 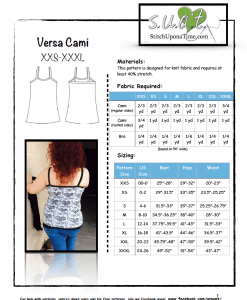 If adding a drawstring, you’ll need medium weight fusible interfacing. 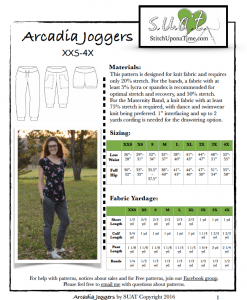 To bind the raw edge of the Front, you’ll need either 1” wide fold over elastic of bias tape. 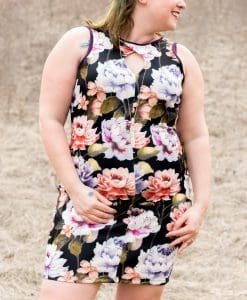 Has become my favorite! 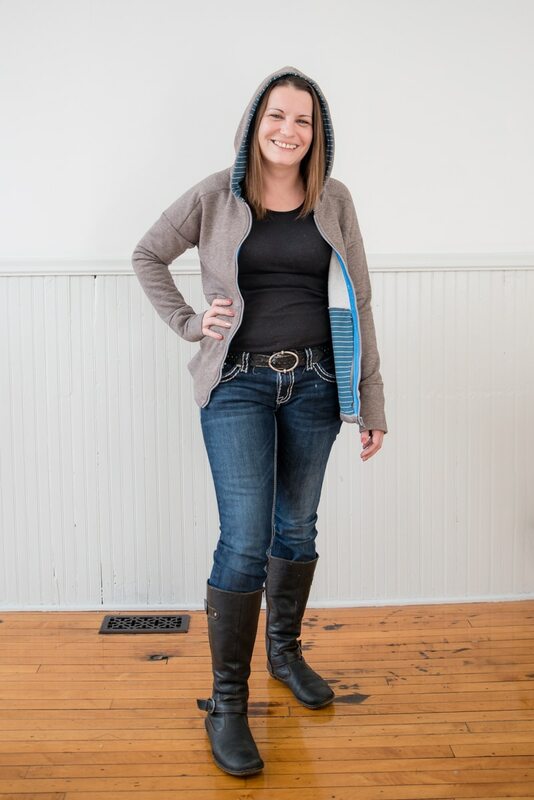 Made mine out of micro fleece and just love it. 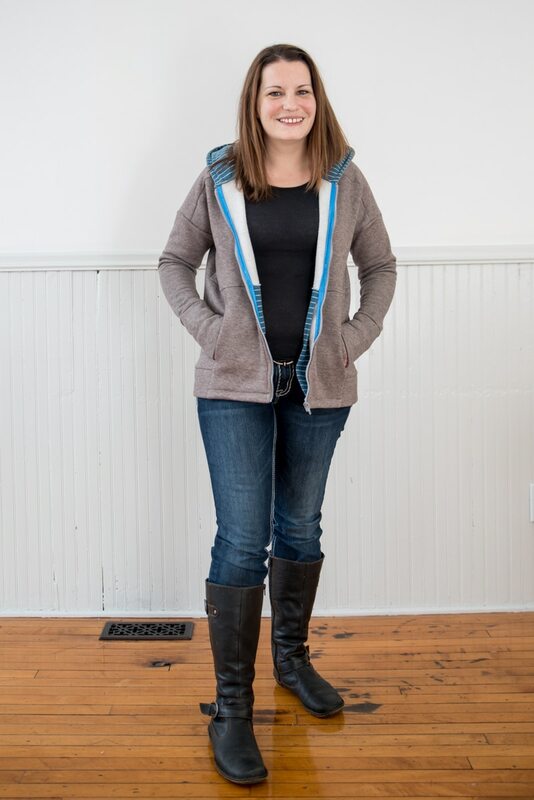 I have rather thick arms, so next time I will make with a little more room.